Bullying, by definition, is committed by those with power against those without it. The current furore over “bullying” on social media was originally, partly at least, grounded in the best of intentions — the need for support and protection of those teenagers and vulnerable people who are hounded to despair and even suicide is self-evident. But who would seek to co-opt this social instinct for their own ends? Who would be venal and self-serving enough to seize on a discussion of the most powerless, the most helpless, and turn it into an appreciation of themselves? Well, have you ever met an Irish politician? It took almost no time for Senator Rónán Mullen to decide that the discussion of bullying should be less about the actual bullying of lonely and frightened children and more about political criticism and satire at his expense. His partner in the clubbable, cozy, male political establishment, Pat “lying is what you do” Rabbitte, was quick to reach across party lines and provide a shoulder for Mullen to cry on. It turns out, you see, that social media is used to criticize politicians! And to make fun of them! Well, we can’t be having that. Now, we can make some allowances for Mullen possessing the typical tissue-thin skin of the ultra-rightist, and Rabbitte not understanding what the Internet is or that the days are gone when politicians automatically received the deference they demand, so in itself there’s nothing newsworthy here. What would be unbelievable, though, what would be hard to credit, is the entrance on the scene of a politician who can claim no ignorance of social media, a previously-active Twitterer with a propensity for street brawling himself, a man given to paroxysms of incoherent rage — and, dare I say it, “bullying” behaviour — on Twitter. It is hard to imagine what sort of a man would demonstrate such a combination of brass neck and mendacious hypocrisy. The Independent’s original “Magda” article illustrates the coziness between Harkin and Harte. This is where I come in. I was not the only person who immediately detected a malicious stitch-up from the newspaper of William Martin Murphy, and criticized Jimmy Harte for taking the article at face value and for his willingness to engage in populist scapegoating of an unemployed immigrant. What I did not realize at the time was the cozy relationship between Harte and Harkin, a sordid symbiosis where each uses the other to amplify his lies. In this particular case, Harkin needed assistance in ridiculing and slandering a woman who was alone and unemployed in a strange country, and Harte was on call to help. “Bullying”, we might call this alliance of two smug, privileged men at the nexus of political and journalistic power in Ireland, with staffs and pension funds, directed against a woman trying to get by. Clearly, then as now, Harte was not expecting criticism. His responses began shortly after Letterkenny’s pubs closed. He did not, of course, address the “Magda” issue or the criticisms I had raised, rather he descended into a fever dream of paranoid ranting about his critics being “sad”, “anti Donegal” and, I don’t know, something about Eamon Dunphy. Let’s note that all this took place on February 2, 2012. In the morning, Jimmy bravely — if, no doubt, sore-headedly — deleted his Tweets and has not Tweeted since. As of now, his Twitter feed clearly shows it has lain dormant since this incident. After a finger-wag from the Labour Party offices, Harte offered a classic not-pology to the aether — he apologized neither to me nor his other new Twitter friends, nor to Ms. Kowalik. I took the matter in stride, and life went on. So, who should show up like a bad penny as the Irish political and journalistic establishment works itself up into a phony, pearl-clutching outrage about social media? 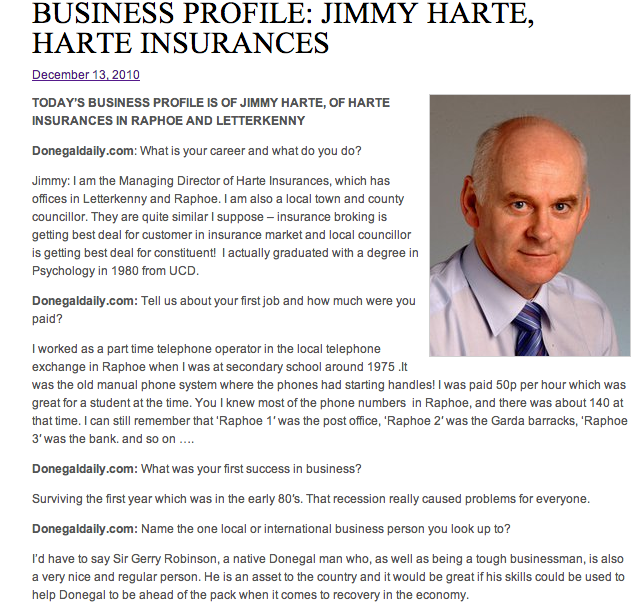 Well, that would be Jimmy Harte. And who is his associate, enabling and amplifying his lies? 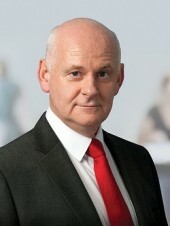 If you guessed the Irish Independent’s Greg Harkin, you win! Harte tells stupid, easily refuted lies, Harkin uncritically reports them as fact. Journalism! 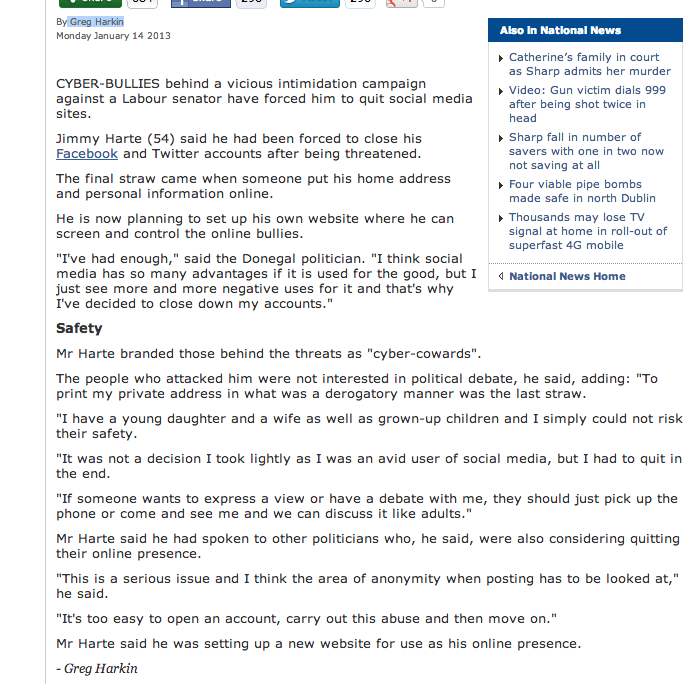 We lead with Harkin simply reporting that “Cyber-bullies behind a vicious intimidation campaign against a Labour senator have forced him to quit social media sites.” He states this as fact, but none of it is true, and he knows none of it is true. A journalist who was told this tale by a politician would have sought to corroborate the facts and investigate them. Harkin, though, writes for the Irish Independent and for his pet politicians, and does what he’s told. As we have already noted, Jimmy Harte closed his Twitter account — or, more accurately, stopped posting to it; it has still not been closed as of this writing — a year ago. He stopped posting after being embarrassed by vicious, nasty things he had posted on Twitter and then deleted. If Greg Harkin were a journalist, he would have reported on that. But Harkin is not a journalist, he is a stooge and a liar who acts in cozy collusion with Jimmy Harte. Almost everything else that Harte says in that article is a lie. He claims threats, but there aren’t any. He rails against the “anonymity” of his Twitter threateners — who remain anonymous because he doesn’t name them, not even by screen name, most likely because they don’t exist. Just How Stupid Do These People Think You Are? Everyone in Ireland knows that this is how the system works. For Harte & Harkin to pretend that the publishing of his home address would represent some sort of vile social media threat is the rankest cynicism. One might wonder where the Labour Party is in all this. Why do they cozy up to the likes of Rónán Mullen against a satirical Twitter account? Why did they only criticize Jimmy Harte’s intemperate ranting, but have nothing to say about the actual substantive issue — the xenophobic slander of the original “Magda” article? 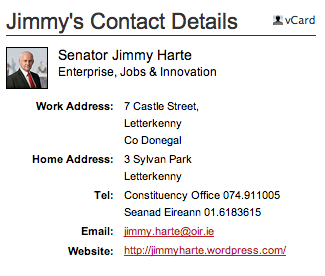 Why, indeed, do they have Jimmy Harte as a senator at all? He was a failure as a Fine Gael politician, so he left in a huff and became a failure as an Independent politician. The Labour Party, for reasons best known to themselves, thought that was the sort of strong, vibrant leadership they needed so they were happy to invite him in and offer him another chance at a Dáil seat, which he failed at yet again. That, the Labour Party thought, made him the ideal person to parachute in as a Senator. At last, the Oireachtas pension that had eluded him! And the ability to speak under parliamentary privilege! And access to servile Indo hacks on the lookout for opportunities for mutual back-scratching! Certainly if I were a member of the Labour Party’s grass roots, I would wonder why such preference was shown to an unrepentant Blueshirt failure with a track record in emotional outbursts timed around the statutory closing of licensed premises. The lesson to be learned here is that hard work and loyalty to the Labour Party doesn’t pay off nearly as well as being the right sort of smug, privileged man of the right age who has sufficient establishment credentials. But that’s today’s Labour Party for you: cozing up to the Independent, tolerant of xenophobia but extremely sensitive about people criticizing politicians on Twitter; not the party of Jim Larkin, but of Jimmy Harte. 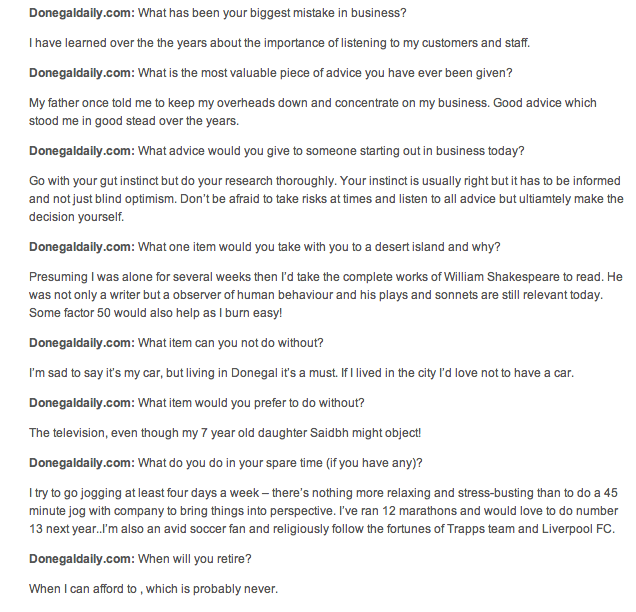 I just found this; it’s Greg Harkin practicing his Indo-calibre journalism skills for the Donegal Daily back in 2010. Watch as Greg asks Jimmy the tough questions! Truly these two were made for each other.